The most recent Honda HR-V model has made its way onto the streets. With the 2019 model, you can be ready to take on anything, no matter where the day brings you. Boasting two new trims and serious cargo and passenger space, the new HR-V doesn’t disappoint. Combined with incredible fuel economy ratings, and up to date and innovative driving features, you’ll be ready to take the HR-V home the moment you get behind the wheel. The 2019 Honda HR-V has a 1.8-liter four-cylinder engine, which produces 141 horsepower and 127 pound-feet of torque. Extremely impressive for a crossover of this size. The powerful engine is paired with a Continuously Variable Transmission (CVT), with the optional front-wheel drive or all-wheel-drive systems. 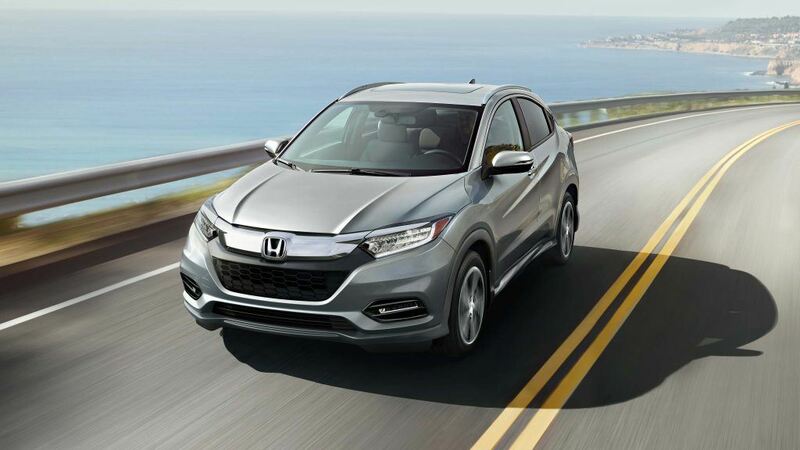 The power of front-wheel drive gives the 2019 Honda HR-V a fuel economy ratings estimated up to 28 miles per gallon in the city, and 34 mpg on the highways for 30 mpg at a combined rate, as per the 2019 EPA mileage ratings. Also to be noted, your mileage will vary depending on your care and maintenance of your vehicle, driving conditions, and so on. Therefore, it is important to have your vehicle professionally serviced, in order to ensure maximum performance and overall safety. The 2019 Honda HR-V features a specially designed sensing system, Honda Sensing. This includes a Collision Mitigation Braking System™, Road Departure Mitigation (RDM) Adaptive Cruise Control (ACC) and Lane Keeping Assist (LKAS). All features are in place to ensure maximum safety and convenience in your new Honda HR-V.
Additionally, an updated version of the Display Audio touchscreen system will be available on the new vehicle, allowing for a user-friendly and convenient driving experience. For more information on if the 2019 Honda HR-V is right for you, visit our Sales team at Henley Honda. Our team will walk you through what makes the Honda HR-V the best in class. Book your test drive today!